Exasperated over tardy recovery of arrears of house tax and user charges (water rate and sewerage charges) the municipal corporation has adopted a novel method to make residents pay up the local taxes by the beat of drum and public announcement in front of the residential or commercial premises of defaulters. In an incident, Tajinderpal Singh, alias Gulam Jugni, who runs a dera in Assi Kalan village has filed a complaint with the Dehlon police stating that his NRI wife was allegedly kidnapped by her parents, as they were opposed to the marriage. 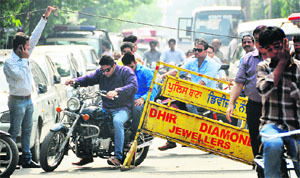 Residents had a hard time today as the traffic was diverted in the wake of Deputy CM Sukhbir Singh Badal's visit to the city. Most of the roads in the city were blocked. Cars were unable to move from Bhai Bala Chowk towards Guru Nanak Bhawan, as barricades had been put up, till the Deputy CM left the city. Giving some relief to city-based traders, Deputy Chief Minister Sukhbir Singh Badal, during his visit to the city today, assured them that he would look into the implementation of the e-trip within the city limits. The Teachers Eligibility Test (TET) Union today expressed contentment over the outcome of the meeting with Deputy Chief Minister Sukhbir Singh Badal. The meeting was convened with the joint efforts of the district administration and the police, following an agitation held by the union recently. 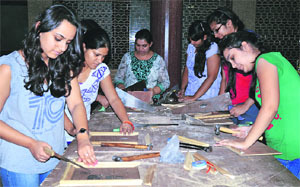 Breaking the stereotypes, girls at International Institute of Fashion Design (INIFD), have enrolled for the carpentry workshop, to get a practical experience in the particular field. The girls are learning to create designs, prototypes and give a finishing touch to the products made from wood. The workshop is not only making them learn, but is also boosting their creativity. The issue of teachers eligibility test (TET)-passed candidates has still not settled down completely and now the part-time lecturers, working in different government colleges across the state, are up in the arms against the state government for not implementing the decisions passed by the Punjab Cabinet in a meeting held on December 3, 2011. Former District Youth Congress president Dimple Rana today joined the Shiromani Akali Dal during a function organised by the District Akali Dal (Urban). 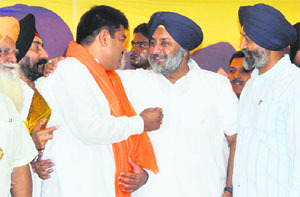 Even as Rana said he was quitting the party in disgust, as he did not fit into the five-star culture represented by the Punjab Pradesh Congress (PPC) leaders, the President of the Punjab Youth Congress Vikram Chaudhary, while talking to The Tribune, said Rana has joined the party (SAD) that represents the seven-star culture. The Pashu Palan Mela at Guru Angad Dev Veterinary and Animal Sciences University will be useful for people from all walks of life. 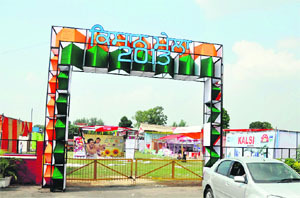 Vice-Chancellor Dr VK Taneja expressed these views on the eve of the two-day fair. Already overburdened teachers are finding it difficult to download question papers from the Internet. Two patients tested positive for dengue today. 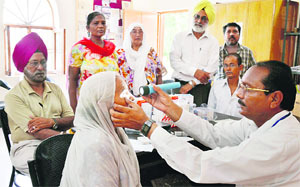 One of the patients, a woman, is a resident of New Aman Nagar. The other is a male patient from Giaspura. To check the growing menace, health staff visited many areas to check the breeding of aedes mosquito that spreads dengue. PAU Kisan Melas have played a vital role in strengthening the state's economy. The melas turn out to be a platform for entrepreneurs, corporate houses and multinational companies. They put their products on display and make a healthy profit. Creating a history of sorts, the Greater Ludhiana Area Development Authority (GLADA) today sold 20 commercial booth sites in Dugri Phase I at a premium of 129 per cent. Ever since the realty market was affected by a slow down a couple of years ago, this is perhaps for the first time that all commercial sites were sold and that too at a high premium against the reserve price. The raids by the Income Department on SEL Group continued for the second day today. The raids are being conducted on 14 premises of the group across the country. A day after members of the BSNL union accused a contractor of misappropriating funds, Rohit Sabharwal refuted the allegations. The District Health Department is gearing up for the Third Sub-National Immunisation campaign, which will start on September 15 and conclude on September 19. District Immunisation Officer Dr Sanjeev Hans said, "Our target is to administer Pulse Polio drops to 3,85,000 children up to the age of five years in a span of five days. The department of veterinary and animal husbandry extension education, Guru Angad Dev Veterinary and Animal Sciences University (GADVASU), Ludhiana, organised two training programmes for dairy farmers of Uttar Pradesh, Rajasthan, Himachal Pradesh, Maharashtra and Punjab. More than 50 farmers attended the programmes sponsored by Indian Immunological Limited, Hyderabad. Dr RS Sahota, director, extension education, was the chief guest. The university will be organising such events on a regular basis. Ludhiana: The postgraduate department of business innovations at the SCD Government College organised a fresher’s party to welcome the newly admitted students. College principal Prof Rajinder Singh urged the students to innovate for the welfare of the society. Priyanka Swami was crowned Miss Fresher and Loveleen Bhatti was adjudged Mr Fresher. The function ended with colourful giddha and bhangra performed by the second-year students. A body was found on a road near a gurdwara at Ghulal village. The passersby informed the police who took the body to Civil Hospital, Samrala, for the post-mortem. Continuing the drive initiated by the local police against the drug peddlers active in the area, the local police today arrested one alleged drug peddler and seized 5 kg of poppy husk from his possession. Besides the police also arrested a person and seized 24 bottles of illicit liquor from him. A 50-year-old man, who was embroiled in a land dispute, committed suicide by hanging himself from a ceiling fan at a house in the Field Gunj area today. The victim was identified as Inderjit Singh. The police has registered a case against Gurvinderpal Singh under Section 306 of the IPC for abetment to suicide. The Court of Additional Sessions Judge, Priya Sood, today recorded the statement of prime prosecution witness Jaspal Singh in the DSP Balraj Gill and Monica Kapila murder case. The last day's proceedings were merely of academic interest as Ludhiana failed to put up any resistance and Mohali scripted an outright victory by 89 runs in the ongoing Punjab State Inter-District Cricket Tournament for Katoch Shield being played at Punjab Agricultural University.